Directed by David O. Russell and written by David O. Russell and Eric Warren Singer, American Hustle is about the ABSCAM operation of the late 70s where a FBI agent teams with a couple of con artists to nab corrupt politicians so that they wouldn’t go to jail. The film explores the world of corruption and scams where con artists do whatever it takes to make money with a FBI agent while dealing with other problems that would do undo them. Starring Christian Bale, Amy Adams, Bradley Cooper, Jennifer Lawrence, and Jeremy Renner. American Hustle is a witty and engaging film from David O. Russell. Though the film is based on a true story, the first thing presented in the film is stated that some of the events in this film is true which reveals that not everything in this story about ABSCAM is true. Still, it is an intriguing story in which two con-artist lovers who have been successful in embezzling money from other people until they’re caught by an ambitious FBI agent who asks them to take part in a con game to nab a New Jersey city mayor who wants to rebuild Atlantic City. The three go along with the scam to nab the mayor but things become complicated when relationships start to occur in a strange love-triangle while adding to the chaos is a con artist’s emotionally-unstable wife. It’s a film that is about the con game where two hustlers just try to do things carefully only to be involved with this FBI agent where the dealings involve the mob. The film’s screenplay by David O. Russell and Eric Warren Singer explores not just the idea of scams and con games but also the individuals involved in the ABSCAM operation. Irving Rosenfeld (Christian Bale) is just a guy who lives his life as a con-artist as he just wants to live a good life despite being married to Rosalyn (Jennifer Lawrence) who is pretty crazy as the only reason Irving doesn’t leave her is because he cares for her son Danny (Sonny and Danny Corbo) whom he has adopted. Rosalyn is a unique character just like Irving as she may be this woman who likes to drink a lot and is quite crazy where she is a liability to everything Irving tries to do in secret. There is a lot more to her that even Irving would eventually realizes as she’s also a threat to Irving’s relationship with his con artist partner/lover Sydney Prosser (Amy Adams) who often goes into the guise as a British woman named Lady Edith Greensly. Sydney is a woman who wasn’t initially involved in Irving’s schemes but realizes how fun it could be where they have an excellent life though she understands why he couldn’t leave Rosalyn which makes her uneasy. When Richie DiMasio (Bradley Cooper) nabs them and is attracted to Sydney in her Edith persona, he would have Irving to teach him the ropes in the art of scamming which Irving reluctantly does as he isn’t sure what Richie wants to do. Even Richie’s own superiors in the FBI are unsure of his plans to nab this New Jersey mayor in Carmine Polito (Jeremy Renner) who has been known as a man of the people. When Irving gets to know Carmine, a conflict begins to emerge in Irving over Richie’s operation where it would go too far as it involved politicians and the Mob that frightens Irving. Eventually, things do go out of control in the third act where much of the first half of the film is comical though things get a bit darker in the second act. Especially as Irving and Sydney realize the danger of what they’re doing and how far Richie is going as even Rosalyn becomes involved. Russell’s direction is pretty lively in the way he plays into the world of the con game where he does infuse the film with a lot of humor but also a shadiness where the film might be a con itself. Still, Russell ensures that there is a story to tell where he spends much of the film’s first 20 minutes to reveal a lot about Irving and Sydney’s relationship and how the former got introduced to the con game. Much of it is sort of told in a montage where Russell does include a lot of voiceover narration as it’s told by Irving, Sydney, and Richie. With Russell using a lot of hidden cameras to play into some of the secrecy of Richie’s operations and the way these secret meetings are set-up. Russell also ensures that there’s some great attention to the way Sydney and Irving play their role in the background with Richie being the center of these schemes. It’s not just the intimacy in Russell’s direction that is interesting in the way some of the drama occurs that includes a very chilling confrontation involving Rosalyn and Sydney. There’s also moments where Russell would infuse a lot of humor into the film that would includes Rosalyn’s antics as she is this unpredictable wildcard. There’s also humor in the way the men look as Richie has this perm, Carmine’s hair is also weird, and Irving is bald with this bad comb over that just adds to the ridiculousness of the film. Russell does get more dramatic in not just his framing but also in the way he plays into a lot of the emotions as well as a sense of disillusionment that starts to occur in the film. Even as it becomes clear that the actions of Irving and Sydney in their game is much smaller in what Richie wants who becomes far more corruptible in his ambitions. Overall, Russell crafts a very masterful yet entertaining film about scams and the ugliness of ambition. Cinematographer Linus Sandgren does amazing work with the film‘s cinematography from the use of its lighting in much of the film‘s interior scenes such as the disco and clubs as well as going for a more naturalistic look for the daytime exterior scenes. Editors Jay Cassidy, Alan Baumgarten, and Crispin Struthers do fantastic work with the editing with its emphasis on style with its use of jump-cuts and montages to help play into the intensity of the story. Production designer Judy Becker, with set decorator Heather Loeffler and art director Jesse Rosenthal, does amazing work with the set pieces from the apartment that Sydney lives in to the house that Irving and Rosalyn live in as well as the look of the cars and such to play into that period of the late 1970s. Costume designer Michael Wilkinson does fabulous work with the costumes from the leisure suits the men wear as well as the lavish dresses of the women including many of the stuff that Sydney wears which are very revealing. Makeup supervisor Trish Seeney does nice work with some of the makeup work for the look of the men as well as the many kind of hairstyles for those characters. Visual effects supervisor Sean Devereaux does terrific work with some of the minimal effects in some of the background scenes in New York City to play up to that period. Sound designer Jay Nierenberg and sound editor John Ross do superb work with the film‘s sound from the way the tapes are being recorded in the schemes as well as some of sounds of the parties the characters go to. The film’s music by Danny Elfman is pretty good as it‘s mostly low-key with its emphasis on rock and jazz while music supervisor Susan Jacobs create a very wild soundtrack that includes music ranging from jazz, rock, disco, soul, and pop from artists like Duke Ellington, Jeff Lynne, America, Chicago, Steely Dan, Donna Summer, Tom Jones, Frank Sinatra, Todd Rundgren, Harold Melvin & the Blue Notes, the Temptations, Paul McCartney & Wings, David Bowie, Elton John, and the Bee Gees. The casting by Lindsay Graham and Mary Vernieu is incredible for the ensemble that is created as it features some small yet noteworthy performances from Colleen Camp as the FBI wire transferee Brenda, Paul Herman as a mob attorney, Shea Whigham as an associate of Irving’s who tries to help make the deal between Irving and Carmine, Michael Pena as an agent who pretends to be Sheik Abdullah, Danny and Sonny Corbo as Irving and Rosalyn’s son Danny, Elisabeth Rohm as Carmine’s wife Dolly, Jack Huston as a mob enforcer Rosalyn falls for in Pete Musane, and Robert de Niro in a great cameo appearance as the mob leader Victor Tellegio. Alessandro Nivola is excellent as FBI superior Anthony Amado who is intrigued by Richie’s ideas while becoming excited by what Richie is offering. Louis C.K. is superb as Richie’s boss Stoddard Thorsen who is unsure of Richie’s plans as he tries to tell Richie a moralistic story while dealing with the craziness that Richie is creating. Jeremy Renner is amazing as Carmine Polito as the mayor of Camden, New Jersey whose hopes to do good for the people of New Jersey has him lost in the scam he’s being targeted for as Renner displays a humility and heartbreak that he would deal with. Jennifer Lawrence is fantastic as Irving’s wife Rosalyn as this very unstable woman who is just wild and unpredictable yet proves to be almost as smart as Irving and Sydney as Lawrence is just a real scene-stealer. Bradley Cooper is brilliant as Richie DiMaso as this ambitious FBI agent who hopes to nab the mob and corrupt politicians with this scam only to lose control of his operation as he falls for Sydney, in her Edith persona, as he also becomes a man lost in his ambitions. Amy Adams is phenomenal as Sydney Prosser as this very vivacious woman who wears scantily-clad clothing and sports a British accent as a British woman named Edith as she is someone who enjoys her lifestyle until she becomes aware of the danger of the scheme she’s in. Finally, there’s Christian Bale in a remarkable performance as Irving Rosenfeld as this very smart con artist who has no problem conning people as he finds himself taking a back seat to Richie’s plans while befriending Carmine as he starts to realize the severity of his actions and how troubling Richie’s scheme has become as it’s performance that has Bale put on extra weight but also a humility into a man who has conned himself into a corner. American Hustle is a marvelous film from David O. Russell. Armed with an amazing ensemble cast and an intriguing look into the ABSCAM operation of the late 1970s. It’s a film that is fun but also compelling to explore the world of scams and how it can corrupt many while hurting those who tried to do good. Even as it explores some of the ugliness of ambition and the loss of identity in a con game. 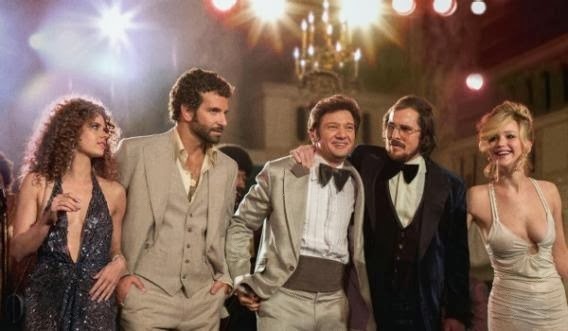 In the end, American Hustle is a sensational film from David O. Russell.